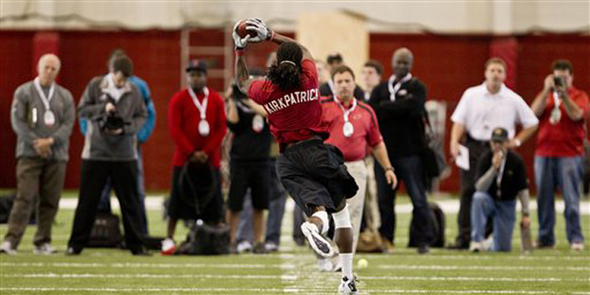 Posted on Fri, Mar 9, 2012 : 5:59 a.m.
Alabama is the defending national champion, but it lost several starters on defense, including cornerback Dre Kirkpatrick. Defending national champion Alabama is a comfortable 14.5-point favorite for its season opener against the Michigan football team in September. But as the Crimson Tide prepare to open their spring camp Friday, they no doubt have work to do before facing the Wolverines in the country's most-anticipated opener — one that will be played at the new Cowboys Stadium in Dallas. Alabama, which went 12-1 last year en route to the national championship, must replace 15 of the 22 players who started in the title game against LSU. That includes seven on defense, where it loses three of four defensive backs and three of four linebackers. Former Alabama defensive back DeQuan Menzie says the Crimson Tide already is thinking about how to stop Michigan quarterback Denard Robinson: "A guy like (Robinson), you got to come up with a lot of schemes." Michigan, on the other hand, returns eight starters to an offense that finished 26th last season in scoring, and expects to be better in the second year of coordinator Al Borges' system. The Crimson Tide are brimming with big-time recruits, and they did finish No. 1 in overall and scoring defense last year, but the issue is whether the reinforcements will be able to pick up coach Nick Saban's notoriously complex defensive schemes. "There ain't no one who can learn that defense in under a year," outgoing free safety Mark Barron said last month at the NFL Scouting Combine in Indianapolis. "We played in a very difficult defense, first of all. We did a lot of different schemes. "I really don’t believe anyone can learn that defense in under a year." Barron, as well as cornerbacks Dre Kirkpatrick and DeQuan Menzie, were three of Alabama's best players last year. Michigan quarterback Denard Robinson won't have to worry about any of them. 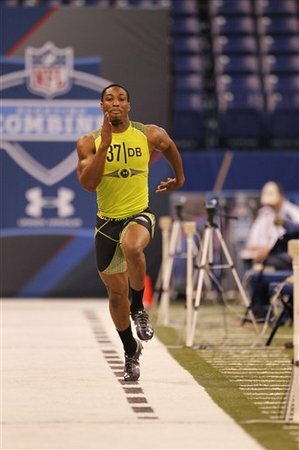 Barron and Kirkpatrick are projected first-round picks in next month's NFL Draft, and Menzie is a mid-round pick. At linebacker, Alabama loses Jerrell Harris, Dont'a Hightower and Courtney Upshaw to the NFL. Only weak-side linebacker Nico Johnson returns. The Crimson Tide also are replacing Josh Chapman at nose tackle. That's a lot of holes to plug in a complicated scheme, with no tuneups of any kind before facing Michigan in Week 1. Menzie said preparations are under way. "They're hyped about it," he said at the combine. "I know they're working hard just for that game. Knowing Coach Saban, they'll be ready." Perhaps complicating things is Robinson, who is entering his third year as Michigan's starting quarterback. Alabama did not face a dual-threat quarterback such as him last year, and it doesn't have a great recent history against them anyway. Menzie compared facing Robinson to taking on Auburn's Cam Netwon in 2010 — when Newton led the Tigers to a 28-27 victory and accounted for all four of his team's touchdowns. "He got loose on us, and Robinson will, too, if we can't contain him," Menzie said. Asked what Saban's game plan is like for a dual-threat quarterback, Menzie said it's not so much predicated on stopping the run, or the pass, but about confusing the quarterback. "A guy like (Robinson), you got to come up with a lot of schemes," he said. "A guy like Cam Newton, and a guy like Denard Robinson, they can beat you so many ways. If you can confuse him, you got a chance." Alabama also is facing issues on offense, where it lost Heisman Trophy-winning tailback Trent Richardson and its top three receivers. Now, it is without Eddie Lacy (turf toe), the apparent heir at tailback, and offensive lineman Arie Kouandijo (knee) for all of spring camp. Receiver Duron Carter, a highly touted junior college transfer who began his career at Ohio State, also is out due to suspension. His return is unknown, which complicates things as Alabama tries to replace its top three receivers. The Crimson Tide also loses center William Vlachos. But according to 5dimes.com, they remain 14.5-point favorites against Michigan — a team that won 11 games last season, and returns as many starters (15) as they are losing. Why? "I mean, we had so much depth, it was crazy," Menzie said. "We still going to be good. We'll start the season off right. Michigan better be ready." Tue, Mar 13, 2012 : 7:19 a.m. Quoting Menzie: &quot;We still going to be good.&quot; Nice to see the high caliber of grammar that these COLLEGE STUDENTS are using these days. Mon, Mar 12, 2012 : 9:15 p.m.
Tue, Mar 13, 2012 : 12:48 a.m.
Mon, Mar 12, 2012 : 9:11 p.m. Sat, Mar 10, 2012 : 8:29 p.m.
Tue, Mar 13, 2012 : 12:46 a.m.
Let's bet the bank ! Sat, Mar 10, 2012 : 12:28 a.m.
14.5 point underdog? Wow, I'll take that in a heartbeat! DRob is a senior and will certainly be a more polished passer next season and will have a year under his belt in Borges' offense. The defense will need to replace Martin and Van Bergen but is returning a bunch of great players. I think Michigan goes neck and neck with Alabama and covers that spread. I'm not saying we'll win but I think 14.5 points is a gift of a line right now for Michigan bettors. Fri, Mar 9, 2012 : 6:54 p.m. They are a 14.5 point favorite? How can they be favored by more points then they will score?! There is no question that Michigan will be facing one of the best teams in the nation from last year! They lose 7 starters on defense alone! Last time this happened to Bama they lost 3 games in 10' because they did not have consistant play on the lines. Beating SEC teams is easy! 1. Your blocking on the offensive line must be consistantly very good! 2. Your Dline must control the line of scrimage and force the terrible SEC QB's to make quick accurate throws to spots not open receivers. 3. Misdirection plays, in particular counters and screens. These plays counter SEC's over aggresive, fast, and down hill philosophies. That is why Michigan has a 18-5-1 record against the SEC and really we should not count the RR years so 18-4-1. I am looking forward to seeing how players develop from year 1 to year 2 under Hoke and company because if it is as exponential as last year Michigan will win by 14.5 or more. Most likely it wont be as drastic of a jump but there will be more progress on the lines in particular. Look for Roh and Campbell to have great years and this defense will be a top 5 defense! On Offense I hope Denard has worked on his passing and fundamentals of dropping back. I think the WR position is not an issue as well as the Oline. Sat, Mar 10, 2012 : 12:13 a.m.
@McQueen Michigan is 18-5-1 against teams that are currently in the SEC. Fri, Mar 9, 2012 : 11:24 p.m.
Fri, Mar 9, 2012 : 11:21 p.m.
Actually Michigan is 25-5-1 vs the sec...but your point remains valid. Fri, Mar 9, 2012 : 8:12 p.m.
Fri, Mar 9, 2012 : 5:21 p.m.
Fri, Mar 9, 2012 : 4:18 p.m. I still want to see Denard start in motion then turn and haul tail down the field straight to the end zone and Devin hit him in stride. Putting him in a long slowly developing sweep will only do so much. Tue, Mar 13, 2012 : 7:26 a.m. Personally I hope the newer kids coming in to play QB progress fast enough to where we don't have to rely on Gardner EVER being the starter. He has shown me ABSOLUTELY NOTHING in terms of being a decent QB. Not sure where ANYONE is getting this information. I think he's horrible. Fri, Mar 9, 2012 : 5:03 p.m.
Fri, Mar 9, 2012 : 3:59 p.m.
Fri, Mar 9, 2012 : 3:37 p.m.
&quot;But according to 5dimes.com, they remain 14.5-point favorites against Michigan — a team that won 11 games last season, and returns as many starters (15) as they are losing. Why?&quot; Because that in theory is the &quot;magic number&quot; that gets 1/2 the betting money on each side. As the game approaches in August keep in mind a &quot;Las Vegas&quot; point spread is an accounting tool not a prediction. &quot;Las Vegas&quot; really never cares who wins a game or by how much. The point spread just balances their books and they take a small &quot;facilitators fee&quot; to take money from the losers of the spread and give it to the winners of the spread. Fri, Mar 9, 2012 : 4:23 p.m. Yes, and it is stunning how often the spread number is so darn close. That is often attributed to &quot;odds makers&quot;, but as you point out it ultimately is reached by finding the number that balances out the bets. This means that football fans, at least those who bet, are pretty knowledgable. Fri, Mar 9, 2012 : 3:25 p.m. Isn't it a little early for this??? &quot;Menzie compared facing Robinson to taking on Auburn's Cam Netwon in 2010.&quot; Terrible comparison by Menzie, they are both dual threats, but thats about it. Newton does a lot more of his running with size and shedding tacklers while Robinson uses speed. Many of Newton's runs were up the middle of the field. As for passing abilities, l I was not impressed with Newton in college, he has done well in the pros. I am not impressed with Robinson's abilities thus far in his career. Fri, Mar 9, 2012 : 2:44 p.m.
Let them set it at Alabama being a 28-point favorite, the more points the better, as far as I'm concerned. More bulletin board material for the players, plus that ugly Sugar Bowl didn't leave me brimming with confidence. Denard has a lot of passing work to do to be prepared for this game, a receiver or two are going to have to rise up, and those new faces on the D-line may have one of the toughest games of their careers right off the bat. Respect him or not, Nick Saban is arguably the best coach in college football, and the Tide will be ready. It's Michigan's burden to prove they are on the same level. This game has the potential to change the way the nation looks at Michigan, but also the entire Big Ten Conference. I wouldn't want it to be any other way. Shock the world, Michigan. Go Blue! Tue, Mar 13, 2012 : 12:44 a.m.
Mon, Mar 12, 2012 : 9:09 p.m.
could not have said it better my friend! Fri, Mar 9, 2012 : 4:13 p.m. Valid points, all true. Denard's improvement in judgement at QB is the key as I am sure his passing skills will improve. Can he play like a Senior-with more polish is the key. Fri, Mar 9, 2012 : 3:26 p.m.
Fri, Mar 9, 2012 : 2:42 p.m.
5 top-5 classes of recruits under the hardest working, most detail oriented HC in college football, that will be a major challenge to compete for the Wolverines. I've thought the one thing we had going was a lot of turnover at Bama, maybe they won't be sorted out yet in the first live game. Tue, Mar 13, 2012 : 12:43 a.m. I agree RWBill....bama going down.......hard ! Fri, Mar 9, 2012 : 10:49 p.m.
You wear fear really well. Fri, Mar 9, 2012 : 2:17 p.m. Odds makers...So What! This isn't Alabama versus a MAC Conference team. I hope Team 133 goes down there with a chip on their shoulder for being strong underdogs. This is reminding me of how the odds makers treated Mich vs FL in the 2008 bowl game when our guys were facing Urban Meyer and Tim Tebow. I'll gladly take the 14 1/2 points. GO BLUE!!! Fri, Mar 9, 2012 : 1:28 p.m. Trying to use smoke and mirrors to argue that Alabama is not necessarily the best team last year is ridiculous. Alabama is lite years ahead of the rest of the field. Michigan has a chance probably a small chance but at least I think, a chance. I would like to see Michigan win obviously but to me it's very important that Mich. makes a good showing win or lose. I believe this game is a barometer for the coaches and I think Urban Meyers will be watching this game very closely and with anticipated interest. If Michigan wants to kiss off the neysayers and show they belong in a league with the big boys in college football then it is my opinion they need a good showing in that game. Go Blue! Fri, Mar 9, 2012 : 10:48 p.m.
Who the _____ cares that Urban Meyer will be watching?! Fri, Mar 9, 2012 : 4:43 p.m.
Fri, Mar 9, 2012 : 2:04 p.m. If your responding to me, I'm not arguing who the &quot;best team&quot; was, I'm arguing the system that crowns a &quot;champion&quot;. And there is absolutely nothing &quot;smoke and mirrors&quot; about my points. If your not responding to me...ignore this response. Fri, Mar 9, 2012 : 12:08 p.m.
Alabama won a mythical &quot;national championship&quot; In sports a champion is supposed to be determined on the field or court. In the BCS since its inception i believe something like 11 teams have finished the season undefeated AND NOT BEEN CHAMPIONS. In all of sports only in BCS college football can a team or athlete win all their competition's , never lose and not be a champion . ITS A PATHETIC JOKE. Fri, Mar 9, 2012 : 2:01 p.m. I keep hoping for a year where every major conference has an undefeated team or every major conference has at least one one-loss team. I'd love to see the BCS and all its supporters struggle untangling that knot. Fri, Mar 9, 2012 : 1:05 p.m.
not to keep kicking this dog, but even this year a bunch of 1 loss teams won their last game. In any other sport pretty much only the champion wins its last game. Fri, Mar 9, 2012 : 12:44 p.m.
its the same system. Its flawed at it core, not only in years when 2 teams finish undefeated. At the end of the regular season there were 5 teams with 1 loss, only 1 got to play for a &quot;Championship&quot;. After the bowls were completed 4 of those 1 loss teams still had 1 loss. That is a flawed system at its core. Just because it appeared to &quot;get it right&quot; this time doesn't mean it did. Fri, Mar 9, 2012 : 12:25 p.m. The problem with your assertion here, there were no undefeated teams remaining last year and no 'real' debate as to the credibility of Alabama's National Championship. I guess the debate on method used to crown the National Champion is a valid one, just not sure it's appropriate here. The point of this article is that Alabama is going to be a VERY tough first game opponent. I like it! Reminds me of the old days. GO BLUE!! Fri, Mar 9, 2012 : 11:48 a.m.
Tisk Tisk ye odds makers. Hey Kyle. How about a trivia game for a free trip to this BIG game? I could help write the questions.....for example..... Question 1 Day 1- What does &quot;MCC&quot; stand for and who is the president? MEEEEEEEEEEEEEEEEANchigan football will roll the tide!!! We will razzle, we will dazzle and kick Saban's Hide!!! Fri, Mar 9, 2012 : 3:33 p.m.
Fri, Mar 9, 2012 : 1:16 p.m. I think Michigan's Community College is UM flint. Fri, Mar 9, 2012 : 12:20 p.m.
Fri, Mar 9, 2012 : 11:21 a.m.
Tue, Mar 13, 2012 : 7:34 a.m. I just hope it's a good game. I hope it's not decided by a crappy call by the officials. GO BLUE !! !